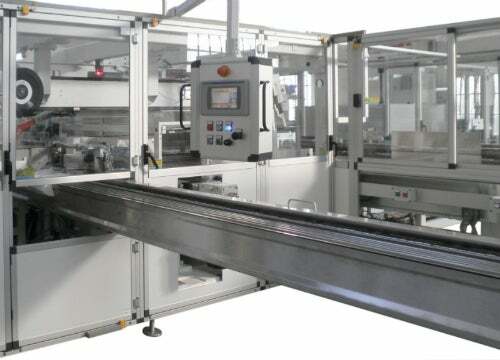 AMOTEK shows a packaging machine that packages various nonwoven products in film bags: The AMOTEK R 168 is suitable for feminine hygiene products, diapers, cotton pads and other products, and even for multipacks depending on the size. The packages can be supplied with euro holes, reinforcements, handle areas, zippers and other features. Different bag shapes can also be managed. The machine produces, on its own, the bags from folded film. An option also exists for the machine to produce the bags from a foil roll. The machine is easy to operate. Its output reaches up to 50 packages/min. For particularly large products, an AMOTEK R 168 XL version is available. The AMOTEK IS 81 was developed specially for diaper packages. The servo-controlled system works with a patented SIEREM stacker. The diapers are taken from the converters with an inline rate of up to 800 pieces a minute and packaged at a rate of up to 55 film bags a minute. The system can be enhanced through the addition of various modules. These include the ability to produce packages with small counts or to load diapers manually into the packaging process. In addition, Amotek will also be providing information at INDEX about its wide range of packaging machines for paper hygiene products. The company has decades of experience and offers efficient and competent service all over the world. Amotek is part of the OPTIMA packaging group GmbH (Schwäbisch Hall). AMOTEK will be at INDEX from 4-7 April, in Genf, Switzerland, Building 2, Booth No. 2581.